Dave Thumpston and Graham Hewitt in Radio Links van. Photo by Colin Pierpoint, no reproduction without permission. in the control room; you check the quality, pass the signal on, and if there is a fault you query it with the previous station. But there were some Comms staff who resented me coming in from Operations, and what they saw incorrectly as the “Radio” Control Room. Some gave me advice on how to do the job “on the road”, not realising that I had already done many Outside Broadcasts for Radio OBs in the Audio Unit. I was used quite a bit for real engineering with a soldering iron, working to Stan Smith the ACSE (Assistant Communications Systems Engineer). 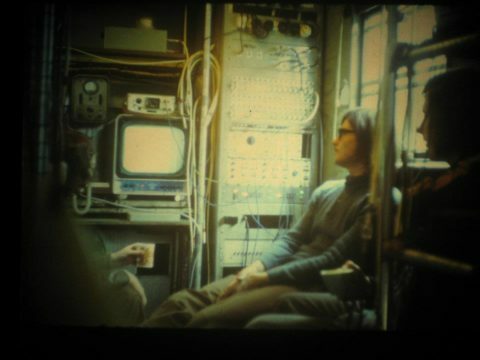 He got me to supervise the wiremen putting in new jumpers on the main distribution frame in the basement of Pebble Mill. Jumpering is adding pairs of wires to provide new circuits. It was necessary because the Comms Centre as it was handed over after installation to Birmingham staff, was missing quite a lot of sound circuits.